One of the communication tools we use when discussing retirement plans is the Personal Economic Model®. Much as a medical doctor would use an anatomical model to convey medical concepts, we use this model to convey financial concepts. 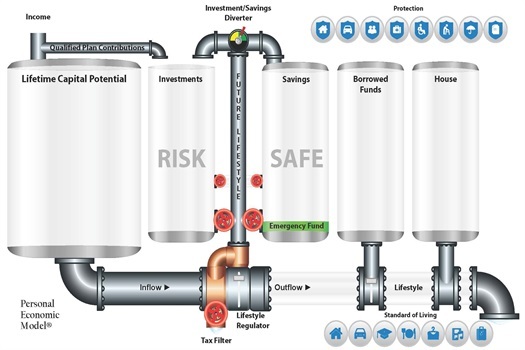 The model offers a visual representation of a family's inflows, outflows, assets, and liabilities. On the left, you will see the Lifetime Capital tank which represents all the money you will earn during your lifetime. It is substantial and also finite. As you earn money it first flows through the Tax Filter where you pay local and federal taxes. The after-tax flow is then directed to either your Current Lifestyle or your Future Lifestyle depending on your position of the Lifestyle Regulator. Determining your balance between your current and future lifestyle will be an important financial decision. Every dollar flowing through your Current Lifestyle will be consumed and gone forever. To save for retirement, you will need to flow savings into the Investment and Savings Tanks. A good long-term plan will flow enough money into the Tanks so that you can enjoy your retirement. Position A would be to have enough in the tanks to live like you live today adjusted for inflation and have your money last to life expectancy. It may be difficult to see what balance you need without the help of a retirement forecast. In working together, we can build a detailed forecast with multiple scenarios to understand the impact of various financial decisions. Using the Personal Economic Model in both the conceptual tool as well as the detailed forecast report may be beneficial in understanding the numbers without having to look through endless reports.